We’re excited to announce a new way to keep NABPAC participants informed and engaged. Having heard your feedback, this newsletter will be the first installment of a monthly series. Our goal is to provide relevant, political information on a more frequent basis. This issue will recap our 2016 achievements, including where the dollars went, how much we raised and recognize companies that supported NABPAC initiatives. A new Congress brings new members and new leaders in the committees that most impact the broadcasting industry. Below is a run-down of the committees with the most relevance to NAB issues. 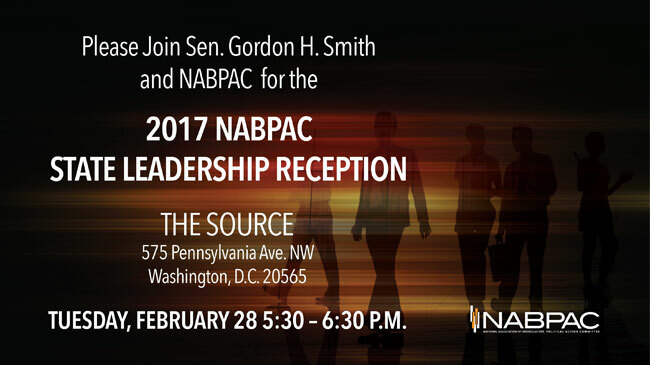 Mark your calendars for Tuesday, February 28 when all NABPAC donors will be invited to our State Leadership Conference reception at the Source. Every year, members of Congress join us, so don’t miss out! We are looking forward to a productive 2017 and an even stronger NABPAC. With your help we can accomplish both. As the 115th Congress begins, it's important to familiarize donors with our key committees of jurisdiction. Members on all of these committees will be important players on broadcast issues that come before Congress. Local Radio Freedom Act is back and stronger than ever! The resolution, which recognizes the important role stations play in local communities and opposes a performance tax on radio, was reintroduced in the House and Senate last week. NAB has already confirmed 115 cosponsors to this legislation, which is more than half the 218 needed to block any performance tax legislation. By the end of the 114th Congress, a bipartisan majority of the House supported the Local Radio Freedom Act with 232 cosponsors. Twenty-seven senators supported the resolution. Let’s keep building support! To view the full list of cosponsors and thank them on social media, click here. Thanks to 830 individual donors, NABPAC had its most successful year yet! Click through for some of our 2016 highlights.